This post is to help to perform the SCCM 1902 upgrade. This post is a comprehensive step by step guide to upgrade SCCM infra. Microsoft released SCCM 1902 in the opt-in/fast ring SLOW ring. 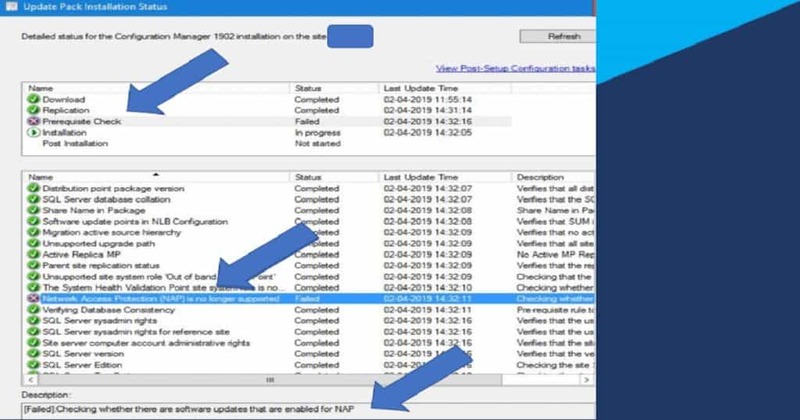 You will get more details about step by step SCCM 1902 upgrade process in this blog post. I’ll release a separate post explaining the new features of SCCM 1902, and that post will also cover what’s new in SCCM 1902. SCCM 1902 is Baseline version? 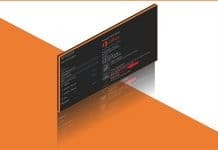 Why SCCM 1902 is NOT Available in Console? SCCM Opt-in or Fast ring is the option given to SCCM admins to get the newest version of SCCM CB using an opt-in PowerShell script. The opt-in version is more for pre-production or staging environments. Your SCCM primary server or CAS won’t get the latest SCCM 1902 update If you don’t run the PS script. 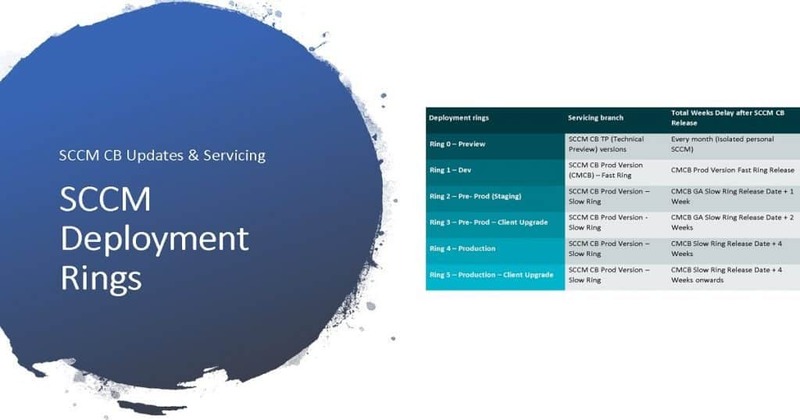 SCCM slow ring release will be available for all the SCCM “online” versions of the service connection point. It’s General availability of SCCM 1902 version. At this stage, you can start installing SCCM version in the production environment. NOTE! 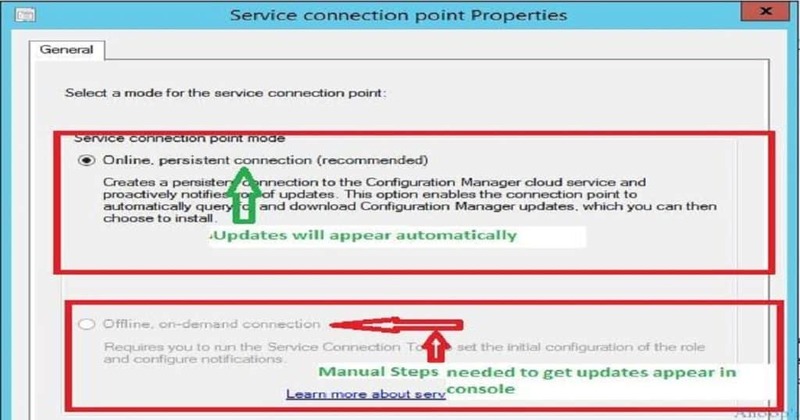 – When you have an offline version of the SCCM service connection point, you need to follow the process explained here. Have you already build a deployment strategy for SCCM CB upgrades? I have a blog post to help you define the SCCM upgrade strategy for your SCCM infrastructure. I think, define deployment rings for SCCM CB upgrade is important for every organization. The upgrade strategy will help to handle change management (iCAB) process within your organization. If you have an online version of the Service connection point. NOTE! – 1902 version released as slow ring now. And available for all SCCM infrastructure (applicable). you need to download the PowerShell script to make this version available at this point of time. More details Powershell script here. You should have an ONLINE Service Connection point to get the updates available in the console. The SCCM 1902 updates are available only for the following versions of SCCM CB. 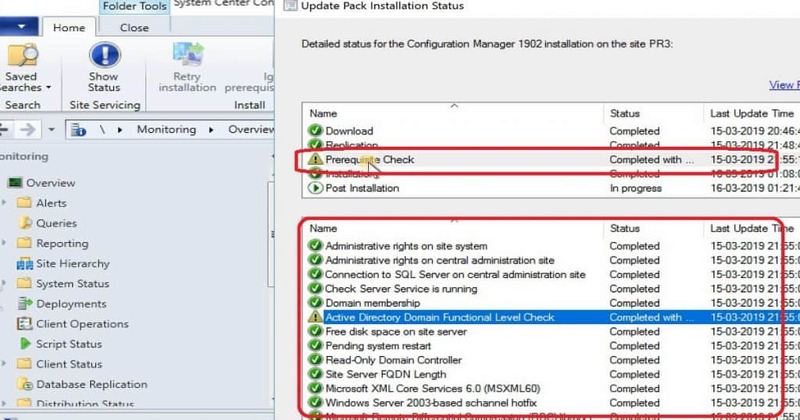 You will get more details about SCCM 1902 upgrade checklist and prerequisites in this section of the post. I would recommend reading the SCCM 1902 upgrade checklist from here. You can also get the details of SCCM 1902 checklist from my previous video blog post. 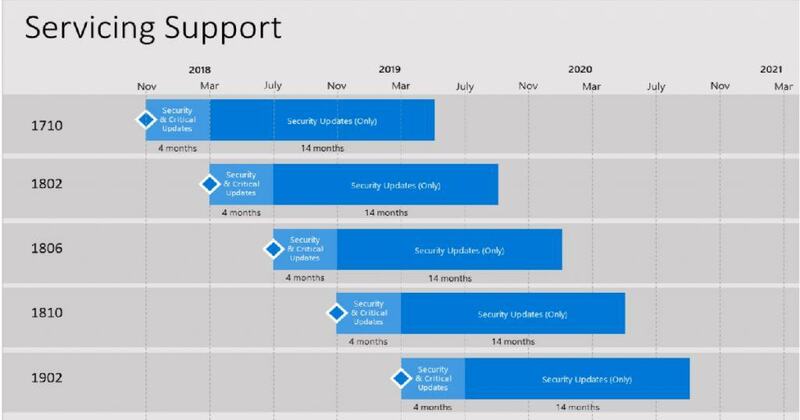 You need to make sure your SQL version is supported and ready for SCCM 1902 upgrade. In an SCCM with multiple sites, different sites can use different versions of SQL Server to host the site database. The following are the support SQL version for SCCM 1902. More details are available here. The following are Windows server OS requirements for SCCM 1902 upgrade. 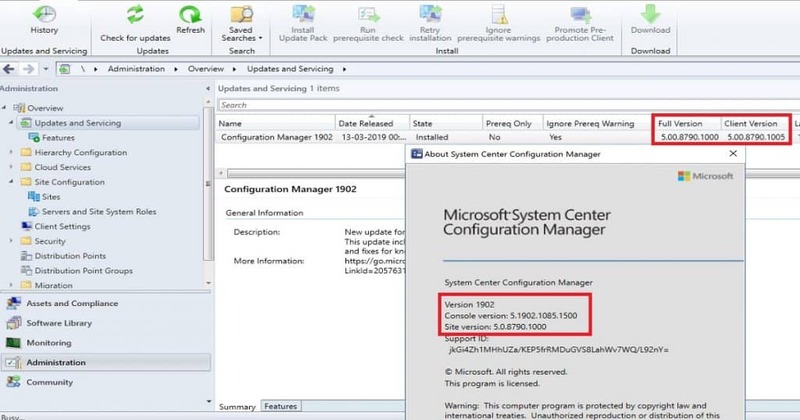 It is essential to check the compatibility of your server version with SCCM 1902. I don’t think this would be an issue for most of SCCM environments. But, it worth checking the list of supported OS for SCCM CB from Microsoft here. 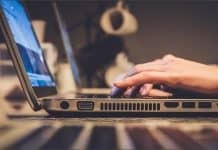 The following are other critical documents which you want to look and confirm whether your SCCM environment is OK to continue with SCCM 1902 upgrade. Yes, SCCM 1902 is going to be the baseline version of SCCM CB. You have to upgrade to the latest baseline version from SCCM 2012. The newest baseline version of SCCM is 1902 (Download SCCM 1902 baseline version). I have noticed one documented issues in the release notes of the SCCM 1902 production version. 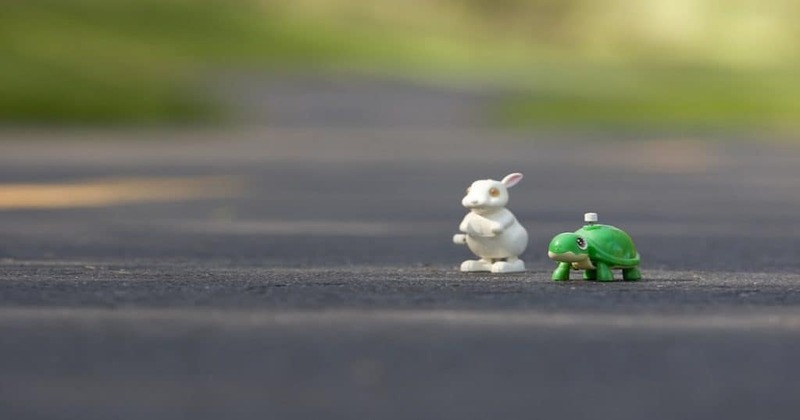 I will share SCCM 1902 known issues in a different blog post (after general availability or slow ring version of SCCM 1902). Until that time, I will update this section of this post. In SCCM 1902, the following built-in security roles don’t have Phased Deployment permission. This issue is because of some missing permissions. This issue is fixed in the SLOW ring released now. I did a blog post on third(3rd) April 2019 to report another known issue. This issue will prevent you from SCCM 1902 upgrade. I don’t think, this issue would be widely spread as this is related to SCCM NAP policies. I would recommend reading the following blog post to get more details about SCCM 1902 prerequisite check failed error. SCCM 1902 Prerequisite Error Network Access Protection (NAP) is No Longer Supported. This issue was an error from customer side. There is no issue with the product. I heard a report about SCCM remote console installation errors when you try to deploy SCCM 1902 console version. The twitter user Russ Gee reported this issue here. 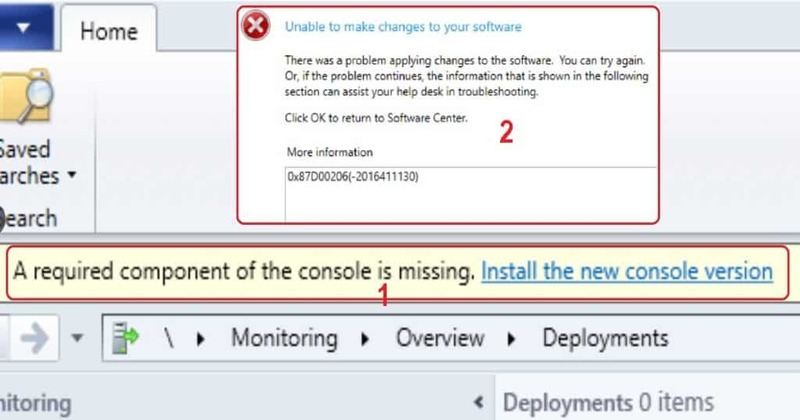 The following error in SCCM 1902 console notification bar – A required component of the console is missing. Install the new console version. When you deploy remote SCCM console to restricted (helpdesk support ) users via Software center, then you might get the following error 0x87D00206(-2016411130). Solution! – Russ Gee noticed the in console upgrade was also downloading configmgr.ac_extension.amd64.cab, configmgr.ac_extension.amd64.cab, configmgr.ac_extension.i386.cab, configmgr.ac_extension.i386.cab, and UIManifest.xml. He added the above files to the package and the SCCM console remote installation started working. Note! – You can check out my previous blog on SCCM 1810 known issues(here). 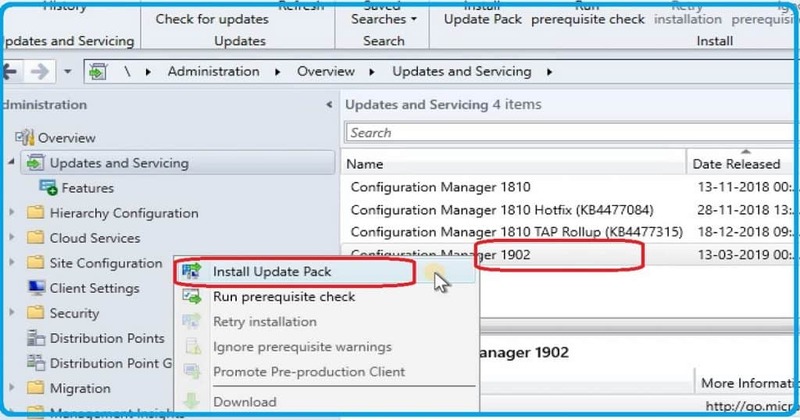 Here are the steps to upgrade your SCCM infra to 1902 production version. 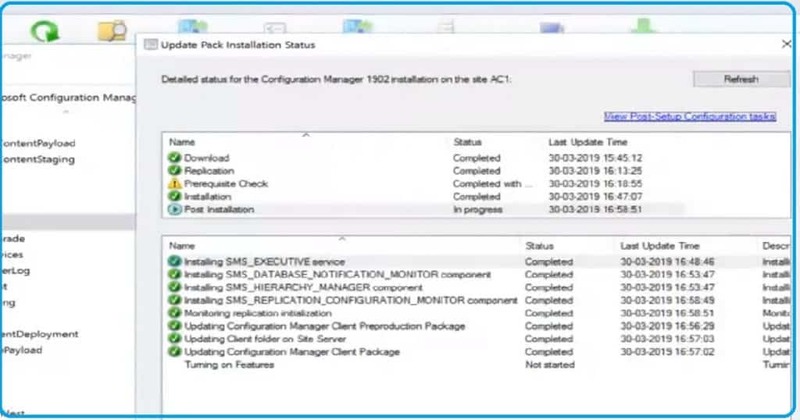 The following are the step by step guide to install or upgrade SCCM 1902. The installation will take a long time depending on DB size, Specs of your server, the performance of the server, etc. 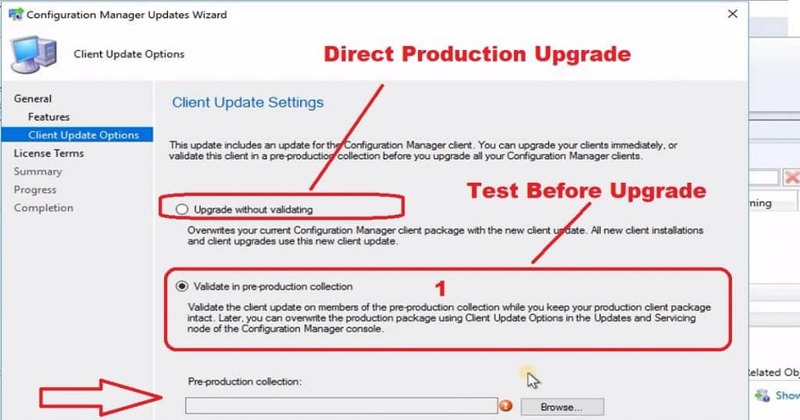 SCCM 1902 Client Update(upgrade) Settings is another important option in Configuration Manager Update Wizard for SCCM 1902 upgrade. I have got a detailed post on client upgrade options. I would recommend reading the same. You can upgrade SCCM clients to 1902 immediately or validate this client in pre-production collection before updating all your SCCM clients to the latest version. I would recommend validating the client version with pre-production collection devices before upgrading the SCCM 1902 client package to all your clients directly. If you select the SCCM client upgrade without validating option, this overwrites your current SCCM client package with the new SCCM client update. All new client installations and client upgrades use this new client update. If you select “Validate in Pre-production collection” option, then you will get an option to validate the new client update on members of pre-production collection while you keep your production client package intact. Later once you are confident with the new client package, you can overwrite the production package using Client Update Options in the Updates and Servicing node of the SCCM console. I’m not going through all boring part of the upgrade process in this section. I would recommend viewing YouTube video to get an experience of SCCM 1902 upgrade process. 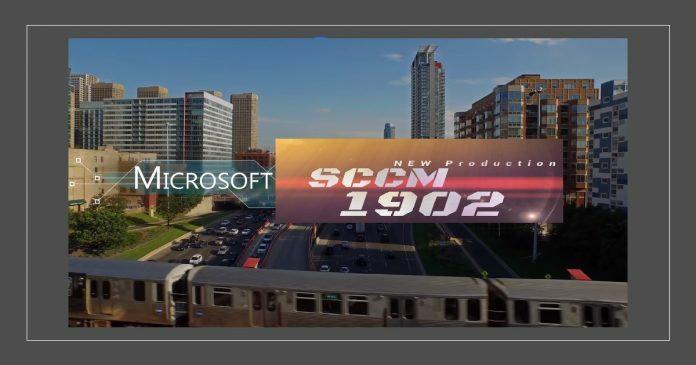 Let’s check out the video tutorial of SCCM 1902 production version upgrade in the following YouTube video. NOTE! 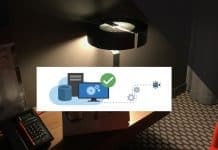 – Do you want to watch an uncut video of SCCM 1902 Upgrade which I shared through Facebook live? If so, check out my Facebook page SCCM 1902 Production version upgrade live video (SCCM Free Training). You can confirm whether the SCCM 1902 upgrade is completed from monitoring and administration workspace of SCCM console. Once the installation of SCCM 1902 is completed, the console will prompt you to update the console version. You need to make sure all your remote SCCM console installations are upgraded to latest version. This console upgrade is not very critical if your remote SCCM console is already running with the ‘n-1’ version (where n = 1902 in this scenario). If your remote console is running with 1810 version, then you are ok too. But I would recommend upgrading remote consoles at the earliest. NOTE! – The newer SCCM console version ribbon notification (as you can in the following picture) is available for only SCCM 1902 console or later versions. You won’t get the same type of notification as part of SCCM 1810 to 1902 console upgrade. Once SCCM 1902 upgrade is completed successfully, then it’s time to concentrate on post-installation tasks. You can get the details of post-installation tasks from the following link here. You could end up in the above situation that SCCM 1902 is not available in your console. Ok, don’t worry your SCCM infra might be fine. Microsoft follows two rings (opt-in and slow rings as mentioned above) when they release SCCM 1902. Microsoft release 1902 in SLOW and FAST rings. The SCCM fast ring won’t be available to your console until you are in opt-in for 1902 update using PowerShell script mentioned above. 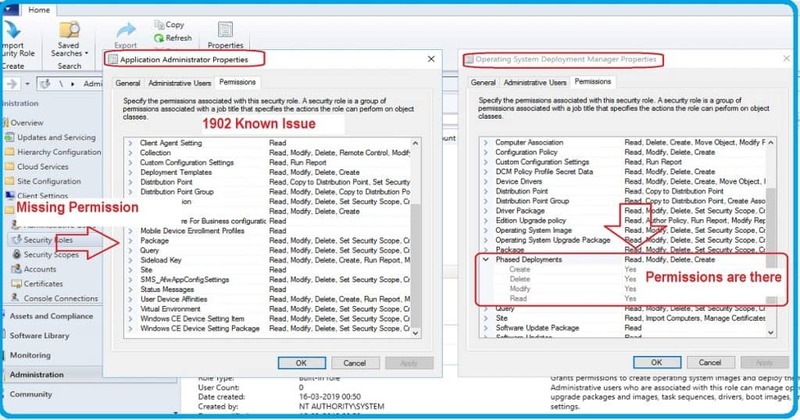 Now the SCCM 1902 version released this week is a FAST/opt-in ring, and that is why you can’t see the latest SCCM 1902 version in your console. Once you complete the opt-in process, SCCM 1902 version will be available in your console. 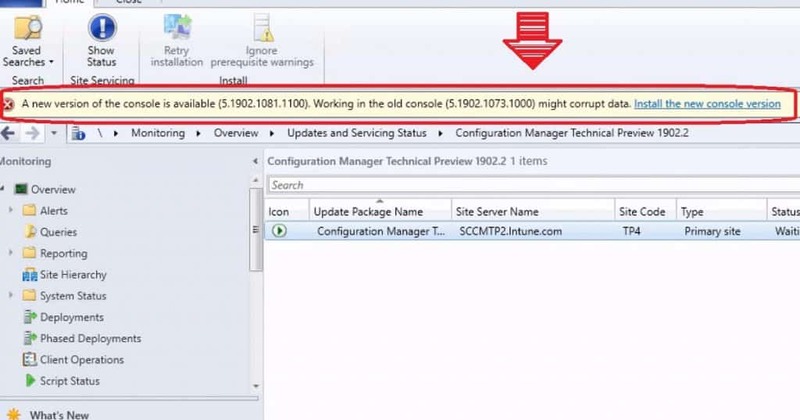 You are not getting SCCM 1902 version update in the console; then I would recommend going through video post about the SCCM CB updates and servicing update issues.